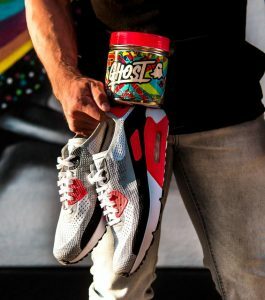 The Ghost Lifestyle brand is a relative newcomer to the workout supplement market that has been getting some serious attention lately. Ghost Pre-Workout is their premium pre-workout product and in this review we get to the bottom of it. We’ll also present you with 3 alternative pre-workouts so that you can compare your options. What’s in Ghost Legend Pre-Workout? Does Ghost Pre-Workout Taste Good? Are There Any Negative Effects of Ghost? 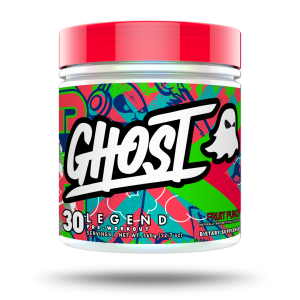 Ghost Legend Pre-Workout consists of two blends which work together to provide a synergistic effect. They are Ghost Smart Energy and Ghost Legend. You also find an artificial sweetener in the form of sucralose. There are also minimum amounts or calcium and potassium. The Ghost Smart Energy blend provides you with about the same amount of caffeine as you’d find in two cups of coffee. That is a considerably lower level than you find in many competing pre-workouts. While it might be sufficient for general fitness advocates, those who are involved in heavy weight training will find that it just doesn’t provide them with enough of a workout boost. The theobromine that has been added to Ghost Smart Energy is also under-dosed in comparison to the opposition. You get 50 grams here which will add slightly to the effect of caffeine, but not much. Ghost Smart Energy includes a gram of taurine which helps to offset the jittery effects that may come with caffeine. Taurine also helps to speed up recovery. You also get 150 mg of Alpha GPC, which has been shown to increase strength and power output. Again, however, this is lower than you would expect and lower than what you find in other products, which are typically dosed at 300 mg. So, what about the Ghost Legend blend? Interestingly, in contrast to its matching blend, this one has beefed up its key ingredients. You get 2 grams of beta alanine, which is about 500 mg than most competitors. Beta alanine will help with endurance and workout energy. However, it will induce a tingly sensation to your extremeties, especially at his dosage. You also get four grams of citrulline. This is also a generous amount, which will help to boost nitric oxide and bring on the pump effect. This speeds up blood flow and increases nutrient and oxygen supply to the working muscle cell. The 500 mg of agmatine sulphate will add to the vasodilation effect to speed up the blood flow. Ghost Legend Pre-Workout comes in four flavors. Two of them are the result of Ghost teaming up with Warheads Candy. The blue raspberry flavor is sweet and tangy. In fact, all of the flavors are really good, with the watermelon and black cherry being the most sour of the two. The downside to the nice taste is that you have to endure the added sucralose which gives the product its flavor. No, Ghost Legend Pre-Workout will not significantly improve your strength levels. But it does not claim to be able to do so. This product is marketed as a pre-workout. Because Ghost Legend Pre-Workout is conservatively dosed with caffeine, you will not have to put up with any post high energy crash. Ghost Legend Pre-Workout should be taken within 20-30 minutes of your workouts on training days. Simply add 1-2 scoops of the powder to 6-8 ounces of water, mix well and the enjoy. 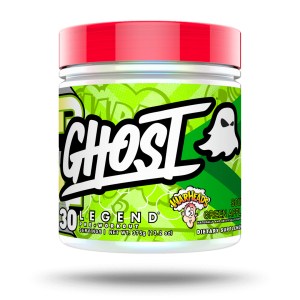 You can pick up a tub of Ghost Legend Pre-Workout for between $40 and $50. That will provide you with 30 servings or a month’s worth if you are training every day of the month. The cost is a little on the high side for a pre-workout which usually works out to about a dollar per serving. 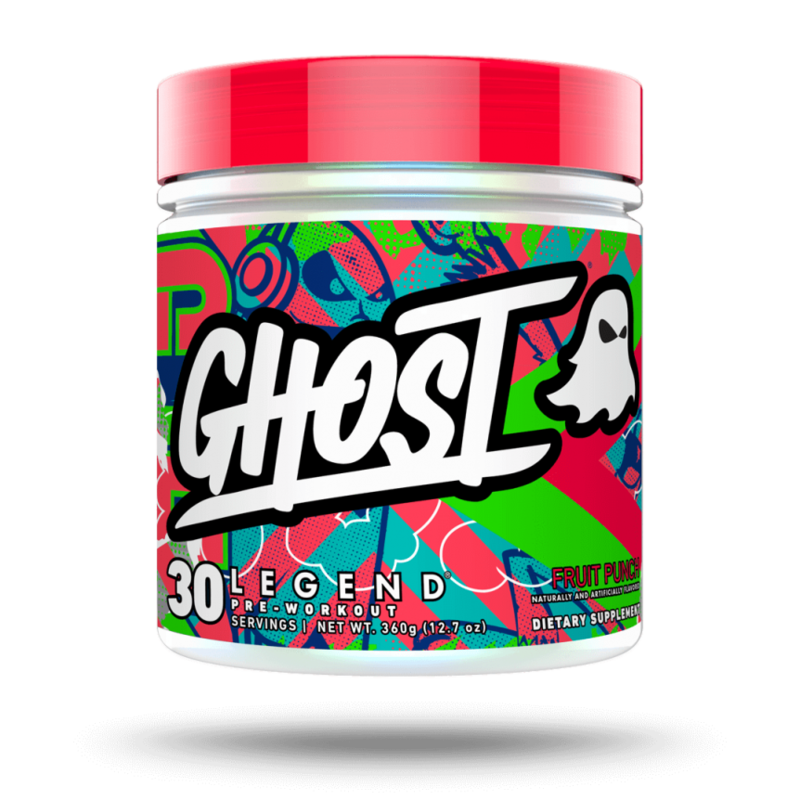 Ghost Legend Pre-Workout does a good, but not an outstanding, job of giving your body the boost it needs to perform. It is under-dosed as far as its stimulants goes, so will not provide enough of a kick for heavy weight trainers. However, its endurance enhancing and nitric oxide boosting qualities are impressive. It all adds up to a middle of the road pre-workout experience. The RedCon 1 Total War pre-workout is designed to boost energy and focus, enhance blood flow for a greater pump effect and enhance strength and endurance. It contains a balanced mix of both stimulatory and non-stimulatory ingredients. 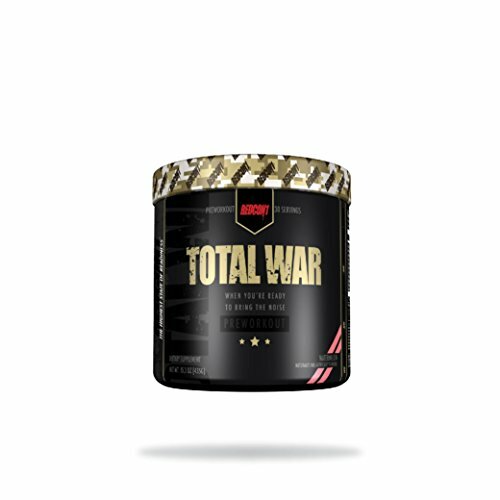 Unlike many of its competitors, Total War is not under dosed in Citrulline Malate. The 6 grams per serve will open the pathways for a serious pump, with the added benefit that you will delay the onset of training fatigue. Beta alanine is also well dosed at 3.2grams. It should be noted, though, that some people may experience a tingling sensation on the extremities and tongue from beta alanine at this dosage. The combination of caffeine at 250 mg and DHA at 100 mg will provide you will solid stimulatory effect, without the jittery effects while training or the post workout crash that comes with higher dosages. 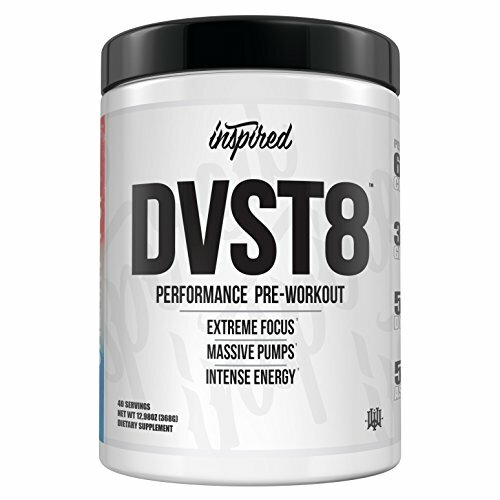 The DVST8 pre-workout is a revamped version of what was already one of the top rated pre-workouts on the market. The addition of DMHA provides both a fat burning and an energy and focus boost to DVST8. You will get more pump, focus, energy and mood enhancement with this one. This product includes three different forms of caffeine within its 325 gram total. The addition of yohimbine and synephrine further enhance the endurance boosting effects of this product. Although the main focus of this product is a pre-workout energy enhancer, DVST8 is a better fat burner than many fat burners on the market. The unique combination of ingredients work to burn fat and suppress appetite. With this in mind, if you are trying to pack on mass, be sure to get in your post workout protein meal. 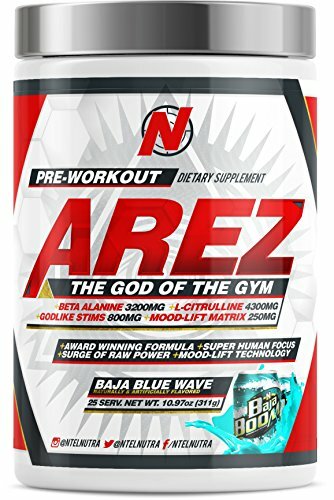 The AREZ God of the Gym pre-workout contains a total of 623 mg of powerful energy enhancing stimulants to rev up your workout. This includes 125 mg of DMHA to give you that tunnel vision and extras strength boost that you’re looking for. Eria Jarensis is added to give deliver a major cognitive enhancing effect by increasing the levels of dopamine and noradrenaline in your body. Beta alanine and citrulline add a strong pump effect, while 350 mg of caffeine anhydrous deliver a major stimulatory effect on the central nervous system, heart and muscles. The overall combination of ingredient mix is a very potent energy hit that comes on fast and lasts for around two hours. You do get a slight crash effect post workout that may have you wanting to take a nap. This product mixes well with a spoon or in a blender bottle and has a pleasant taste. Ghost Legion Pre-Workout is a pre-workout booster that is geared towards your average workout enthusiast. It is mildly stimulant, providing you with a little over 200 mg of caffeine, boosted by a little taurine. It does a better job of enhancing your endurance and enhancing blood flow, but will still not be up to the level of oomph needed by heavy trainers. If you are after a more stimulant heavy pro-workout that will power you through a gruelling workout, we recommend Redcon 1’s Total War, which gives you 250mg of caffeine boosted by 100mg of DMHA. This will give you the energy surge that you need without the potential crash that you may get from such products as DVST8 and Arez God of the Gym.